TSN Toronto reporter Mark Masters checks in daily with news and notes on the Maple Leafs, who practised at the Ice Den in Scottsdale, Ariz., on Friday. As a kid, Auston Matthews used to visit the Ice Den in Scottsdale to watch the Coyotes practice. On Friday, the 21-year-old was on the ice at the same complex taking part in his own practice with the Toronto Maple Leafs. "This is kind of where I started to play hockey and it felt kind of funny being back here with my NHL team and practising in the rink I grew up in," he said with a smile. "It's special being back. It’s fun seeing all the kids and everybody excited for us. It’s just a practice, but the whole rink is jammed with people watching, so it’s pretty cool." Matthews is so popular in the hockey community here that former Coyotes stars Shane Doan and Daniel Brière have been known to argue about who was really Auston’s favourite player when he was growing up. "They joke around, but I loved them both," Matthews noted with a chuckle. "Danny, I loved the way he celebrated goals. Actually, skating out here I’d always kind of mimic his celebrations. But Doaner was always my guy. Captain Coyote. He was just a fun player to watch, I mean, he’d hit guys. He’d do it all out there. I can’t say I had a favourite, because they like to fight over it." The schedule makers have done Matthews a solid this year. The Leafs will spend three nights in his hometown and have a full day off on Sunday. So, that means some time at his childhood home where, no surprise, he's also a pretty popular guy. The smile rarely left Matthews’ face on Friday. The Ice Den was buzzing as a minor hockey tournament was taking place on the other pads and many kids ventured over eager to get a glimpse at the biggest hockey talent to ever emerge from the Valley of the Sun. Matthews is well aware of his role as ambassador to the sunbelt stars of tomorrow. On the ice, Matthews is translating his incredible work ethic into big-time production. After potting a couple goals on Thursday against the Vegas Golden Knights, Matthews is now up to 101 in just 187 NHL games. “Pretty impressive,” defenceman Morgan Rielly said on Thursday night. "That's kind of par for the course for Matty, though. He's one of the best players in the world. He's my favourite player right now, the way he can shoot the puck. You want to say you're proud of him, but it's kind of what you expect." "He takes it in stride," said linemate Patrick Marleau, who's become close friends with Matthews over the last two years. "He's probably already looking forward to the next game. He's very competitive and he wants to succeed. He's always looking at what he can do next, that's huge for him." 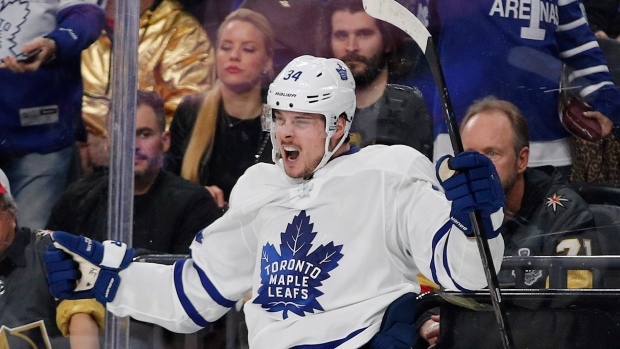 While his shot gets him on the highlight reels, Matthews believes his greatest improvement this season has come in a different aspect of his game. "I feel like I'm skating a lot better this year," he said. "Just kind of getting up and down the ice, utilizing my body and that’s a big thing that Babs harps on me for and I agree with him. When I’m skating and moving it’s kind of hard to defend." "Babs" would be Mike Babcock, who has described the recent play of Matthews as "really dominant." "His engine is just getting better and better," the Leafs coach said. "I don’t know if people understand, when you arrive in the league they know who you are, you’re a good player and all that, but as time goes on there’s less and less and less and less space and you got to skate better and better and better, especially if you’re going to play centre. If you want to be a dominant two-way centre, and when he talks to me he always talks about that, you got to really skate and it’s not easy. Lots of nights when you don’t feel it, you got to have legs, you got to push through it anyway. I think the last three games he’s skated as good as he’s skated." "I had a similar look in the first period and he kind of guessed correctly and didn't really go down. So, I thought the second time, you know, just fire it on the ice and see if he'd do the same thing and lucky enough he guessed I was going short side again." "He has an incredible shot and he just finds a way," said Leafs goalie Frederik Andersen. "It's been pretty amazing to see over the last few years the way he can put it in the net. It's a pleasure to play with him." On Saturday, Matthews gets the chance to play an NHL game at home for the third time. He had an assist in his rookie season and scored last year. He tends to grab the moment when it comes to special occasions. "I know he always looks forward to this game," said right winger Mitch Marner. "I'm sure he'll have a lot of family and friends there and he doesn't need much help to get ready for this one." After injuring his left leg on a kneeing penalty by Brayden McNabb last night, Andreas Johnsson sat out practice. But the 24-year-old was spotted walking around the practice rink without crutches or a brace. "They don't seem to think it's a real big deal," Babcock said. "He'll miss tomorrow [Saturday] for sure and then it'll be day-to-day." Connor Brown filled in as the third-line left winger opposite Nazem Kadri and William Nylander while Tyler Ennis will slide in on the fourth line. It will be his first chance to play since breaking his ankle against the New York Rangers on Dec. 22. Ennis has been cleared since last weekend, but with the Leafs winning and the fourth line performing well, Babcock didn't want to make a change. "It's going to be fun," the 29-year-old said. "I can't wait." After missing 21 games, Ennis was asked what will be the biggest challenge. "Probably just the timing," he said. "But, I've been in this position before and I think it's just about using my speed and my energy and playing as hard as I can." Ennis has seven goals and four assists in 33 games this season. Marner always throws a puck to a fan during the pre-game warm-up and it often leads to a special moment. The latest example came last night when the 21-year-old answered a request from a young girl who brought a sign to T-Mobile Arena asking him to be her Valentine. "Before the game I saw that one of her family members tweeted out that they were there so as soon as I got on the ice I was looking for it. At the end of warm-ups I usually throw one over so I went right over to her. Obviously, saw the sign and it was a pretty cool interaction." "I thought that was great," said Babcock. "I like all that stuff. As long as you understand that the only reason you get to do this for a living is because you have fans, then you never lose sight of what's important. The game’s about the people and the people that love it and the reason you're in it is you love it and you'd do it for free and you're blessed to be in this game. To share that moment, I saw it and I thought it was spectacular." Marner calls it “eye-opening” to see how many Leafs fans travel to road games. "Playing here, it's a blessing," he said. "It's great seeing those signs. It's awesome ... It's hard, because usually I only like throwing over one so I try to pick one sign and one person."